During the first week of February my job took me to Phoenix, AZ and before flying home, I took the opportunity to visit the Catalina Sky Survey (CSS) team in Tucson. I met up with Principal Investigator Ed Beshore and co-I. 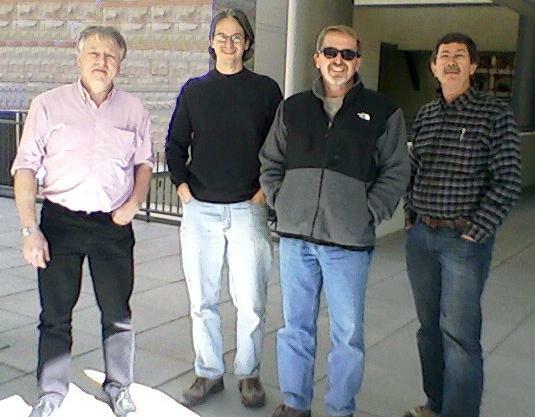 Steve Larson at the Lunar and Planetary Laboratory within the University of Arizona campus for lunch and we were joined soon after by Richard Kowalski and Rik Hill from the CSS and by Carl Hergenrother from the Minor Planet Center (MPC), also based in Tucson. Later in the afternoon Ed drove me up the winding Catalina Highway to Mt. Lemmon, a 1.5 hour journey, initially crossing the Catalina foothills covered with magnificent Saguaro Cacti. Half way up the mountain, stunning views unfolded across Tucson, to Kitt Peak 55 miles to the southwest and to Mt. Hopkins with the MMT 50 miles south, not surprising the area is dubbed "Optical Valley". Some miles before reaching our destination we passed the snow line and saw the devastation caused by the forest fires that came close to destroying the CSS observatories back in the summer of 2003. Once we arrived at the summit of Mt. 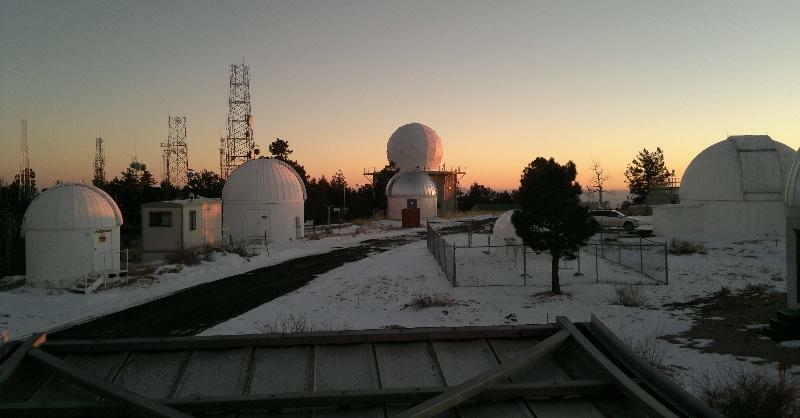 Lemmon (9200ft above sea level), the Large Binocular Telescope on the summit of Mt. Graham 50 miles to the northwest was plainly visible, with the lengthening shadow of Mt. Lemmon pointing almost directly at it. 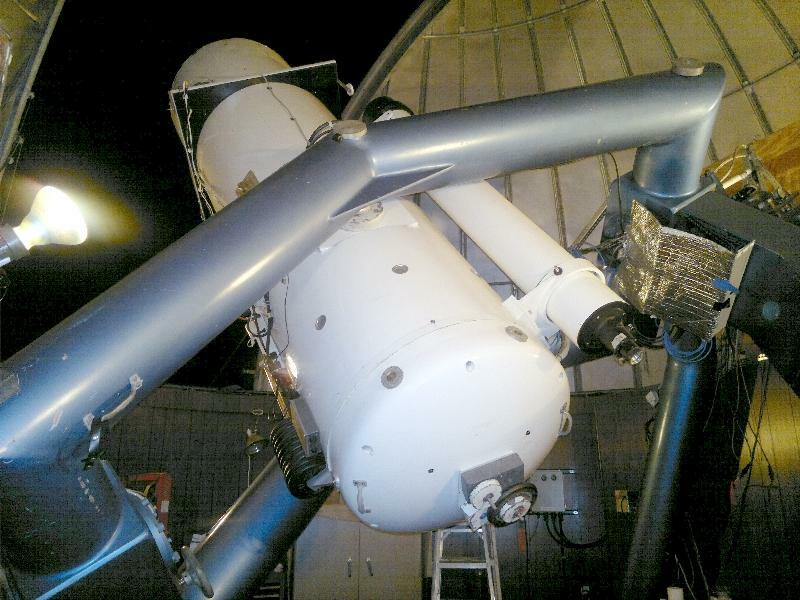 As the Sun was setting, Ed opened up the dome of the 1.5-m reflector (observatory code G96) and started the initialisation of the equipment before the beginning of the nights NEO surveying. 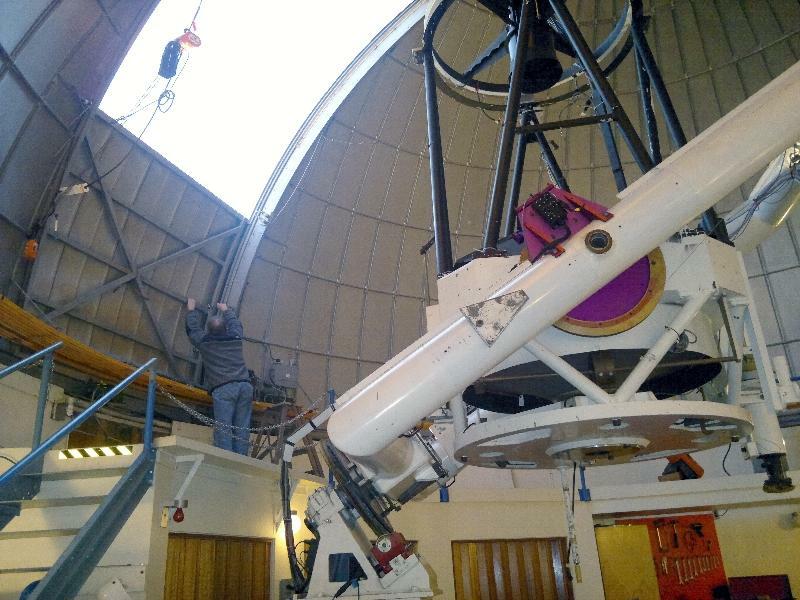 The observer for the night, Alex Gibbs arrived and continued preparing the telescope. The 4K x 4K CCD is normally operated at -100°C but that temperature has recently been difficult to get down to, an air dryer unit used to extract water from the cooling system suspected of being full of water and needing replacing soon. Alex kept an eye on the CCD temperature and ran through focussing sequences and also started choosing fields in the early evening sky ready for the survey work to start. 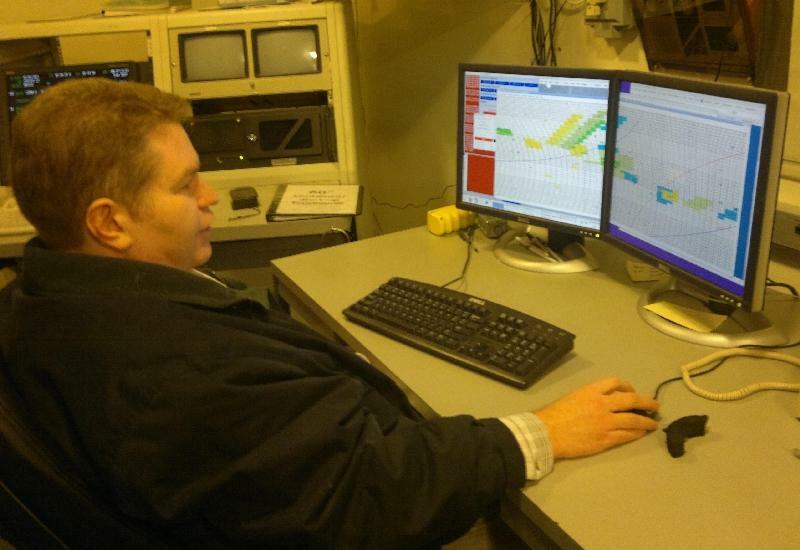 Two computer flat screen monitors arranged side-by-side displayed the sky divided up into the fixed 1.2° x 1.2° field centres that are used night after night for all the survey work with the 1.5-m telescope. 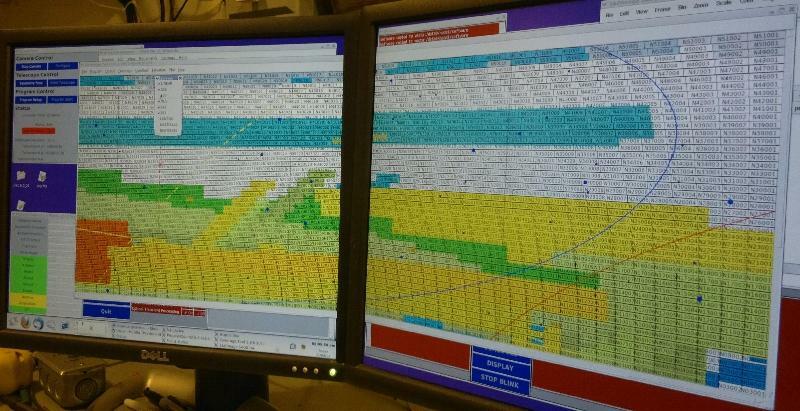 Settings allowed the areas of sky that CSS and the other surveys such as LINEAR and Spacewatch had covered in recent nights to be colour-coded so that fresh unsurveyed sky could be targeted that evening. Alex clicked on sets of 12 adjacent fields with the mouse, each set of 12 fields would be automatically imaged one after another, going around the set a total of four times. All the images would then be fed into the processing pipeline for automatic moving object detection. Lines on the computer screen marking out 60° elongation from the Sun indicate the westernmost boundary and surveying then proceeds to the east as the night progresses, with the observer manually choosing the areas of sky to be targeted. Earlier in the week Pan-STARRS had been given a complete night dedicated to NEO detection, resulting in 27 Pan-STARRS objects being on the NEO Confirmation Page, most very faint at mag. 22-23 and out of the reach of amateurs. Alex selected some of the sets of survey fields to cover the uncertainty areas where some of the Pan-STARRS objects were located to try and help recover them. As astronomical twilight ended the exposures started and soon the first set of 12 x 4 images had been processed and was ready for examination. The CSS software detects objects that have consistent movement on all four frames of each field, down to a signal-to-noise threshold of about 1.2 (i.e. 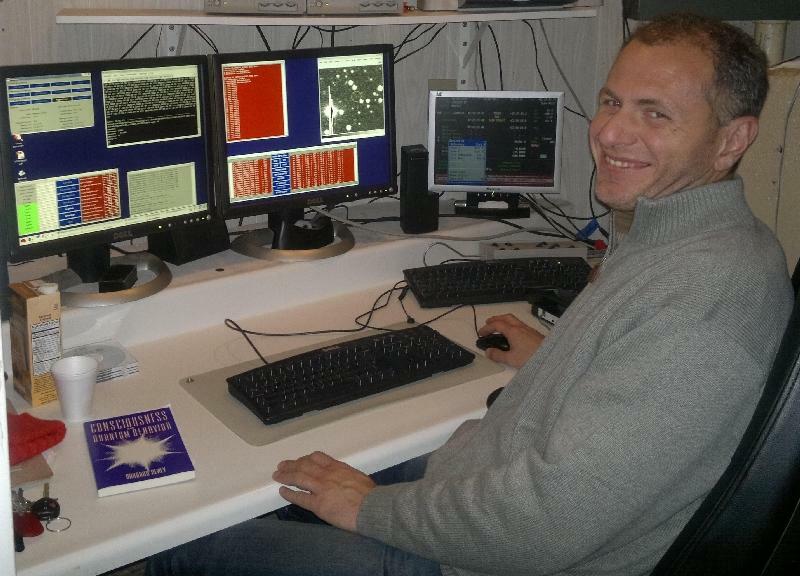 deep into the random noise in the images) and then matches those detections against the latest orbits in the MPC's MPCORB Minor Planet database. Each set of four images is then blinked, with known objects marked in green. All the remaining detections are then visually checked by the observer and those that look convincing are manually selected, the rest discarded. A score is then determined for each new object depending on its rate and direction of motion, together with where it is located in the sky to indicate its chance of being a NEO. Astrometry is measured for all the objects and sent off to the MPC, any objects that look like they are particularly interesting have further exposures scheduled for later in the night to help with the follow-up effort. With the 1.5-m telescope in full operation, Ed and I left to drive the 7 miles down to Mt. Bigalow where the CSS 0.68-m Schmidt is located (observatory code 703), 1000ft below the Mt. Lemmon telescope. That night Andrea Boattini was the observer (he was the only member of the CSS team I had met before, at the MACE meeting in Mallorca in 2003) and as we arrived he was busy blinking a set of images with 100+ moving objects, expertly selecting or rejecting the automatic detections at a remarkably fast rate!